I left a comment on Wes’ blog after this rather unfortunate event happened. I decided to repost here with a few additional thoughts and modifications. 1. It’s important we understand and accept the trade offs with technology. Too often we in the ed tech community have to oversell technology in order to make in roads. We’re not naive, I don’t think we ignore the downsides, but perhaps if we prepare folks for deeper understanding, these kinds of things won’t be seen as a reason to discontinue. 99.99% of my experience in sharing has been overwhelmingly positive. I have to think that for most people who have made sharing a part of what they do, it’s similar. But I’m afraid if you’ve not made this your default, it might make you gun shy. That’s unfortunate. Yes, occasionally sharing goes bad. But in the same way that being kind can backfire, I hope it wouldn’t stop you from continuing to be kind. Understand this comes with the territory. Some might suggest Wes shouldn’t post pictures of his kids. I disagree. Many of his images have been used for positive outcomes. If not Wes’ kids they would have found somebody else’s. Would this mean we’d never post pictures of children for fear someone might do something nefarious? I would argue that notion is problematic. 2. The triteness of social media is starting to get stupid. Twitter is the epitome of this as the 140 characters is not being acknowledged for its limitations. It’s a great medium that does certainly things well. But we often we try and craft to many ideas inside those few characters and it comes off like this. Personally, I’ve been careful not to engage in much meaningful discourse there because it can’t do the things I’m doing here…explaining myself in detail. Even the use of quotes and pithy sayings is getting problematic. Not that I’m immune to it and do share those too, but I’m trying to ask myself and others questions like, “What exactly are you saying?” and “Wait a minute, I’m not so sure that’s true” but often if the words seem to flow and fit and if you add a compelling image, you can get away with a frivolous idea and seem wise. A pithy quote might be a useful way to engage but often is incapable of capturing the full nuance of important ideas. Particularly as these can gain momentum quickly with retweets and favorites, I worry that we turn off our crap detector in favour of jumping on the bandwagon that can seem edgy and clever but may be lacking much reflection or perspective. I’m fortunate that in my network I have people who aren’t afraid to call me out on some of those pithy quotes I share and force me to think before I post and engage afterwards to insure that I put a little meat on the bone. I’ve been sharing a series of staged photos with audiences that show my family all sitting around reading a book, then one of them on their devices and finally one of them looking at their devices together. The point I make is that we somehow have a negative reaction to the image like the one shown of your kids but swap those devices for books and suddenly we have beautiful children engaging in an intellectual pursuit vs the word they used in their collage. 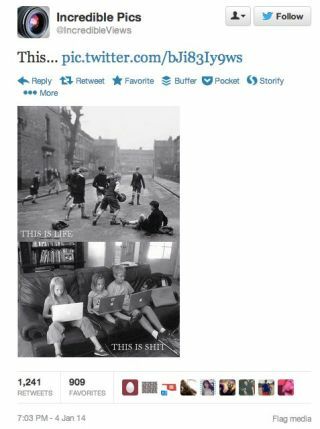 I extend the argument further and suggest that I find the image of them sharing their devices the more social. My point as well is that books have been promoting isolation and anti-social behaviour long before computers came along. We simply have to stop using these kinds of things to polarize us. Would something like this stop you from sharing or thinking about starting to share? How often are we calling BS on pithy quotes that seem to get applause from many others? When will we making general assumptions that using technology is a mindless, intellectually shallow activity?